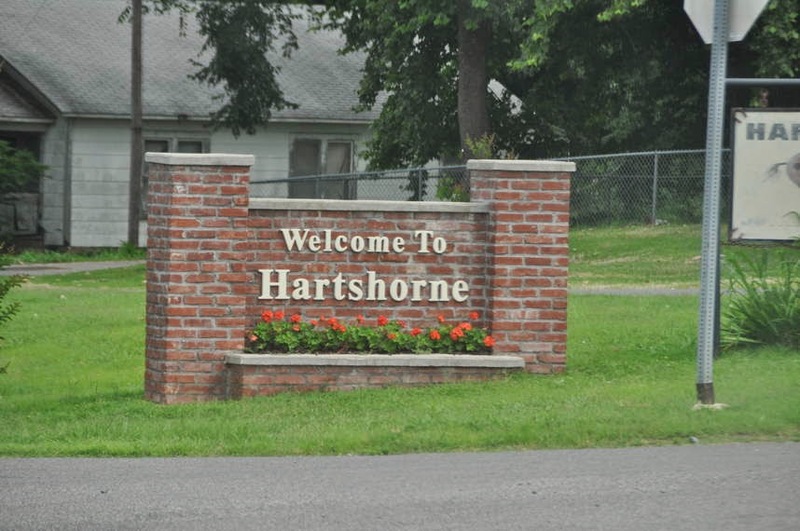 We started off with an overcast day as we left Kingfisher, OK and headed to Hartshorne, OK where Lo's dad, Monroe Brandy, Sr. lives. We put on Lo's iPod since he has lots of music. Can you imagine blues, R&B, jazz & comedy all in the same hour? We started listening to B.B. King, then Smokey Robinson then Jeff Foxworthy talking about his kin. Ok, maybe we should take it off random play. We drive to McAlester, OK which is the biggest city before dads house. We get on the Indian Pike Turnpike Toll road. What the heck is with the tolls? None of them have the same charge, and you have to have the exact cash. That means most of them will not take any dollars bills. I kid you not. Sometimes we pay $.60, $1.15, $2.60, $4.00. So we now keep a Ziploc bag of change. We finally arrived in dad's town. Town really is 3 blocks, 3 gas stations, 1 stop light and 8 churches and a Sonic. If ya'll don't know about Sonic you have not been to the South. Think A&W drive inn burger back in the day. Lo decided it would be easier turning the Hilton on a street 1 block pass dads house. Unfortunately he missed that street as we could not determine if the street really was a street. You know small towns. So we went down one more. (The Hilton doesn't stop or turn around easily.) Boy, this was a challenge. Low branches an a narrow street. So we crept down the street as branches scraped the Hilton's top. When we cleared this the road we were suppose to turn on was scary. It was made out of two old boards layed across a ditch!! We looked at this and I said H..to the L NO!!! We are way to heavy for this. Imagine getting stuck and having to call a tow truck. NOT!! So we went down another street. Finally, we get to dad's house and he is not home. 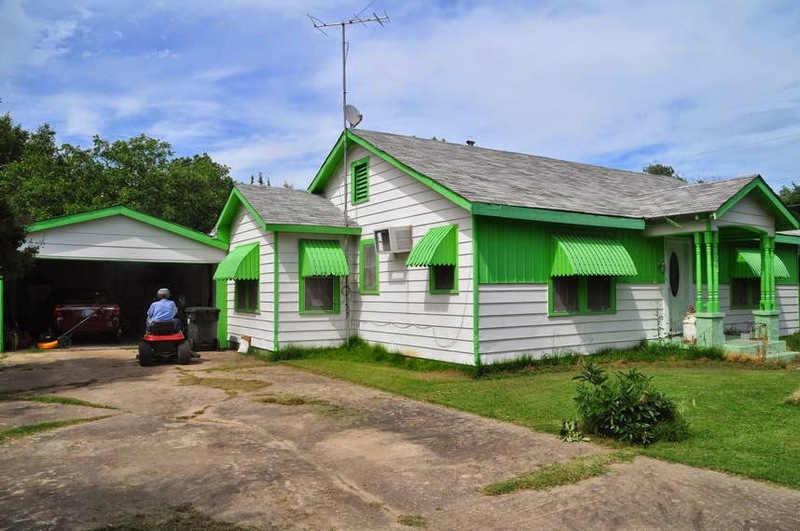 Yep that is quite some lime green house. He is a Baptist pastor and his church is down the street on the corner. I decided to go there as a church member lives next to the church and she always knows where dad is. 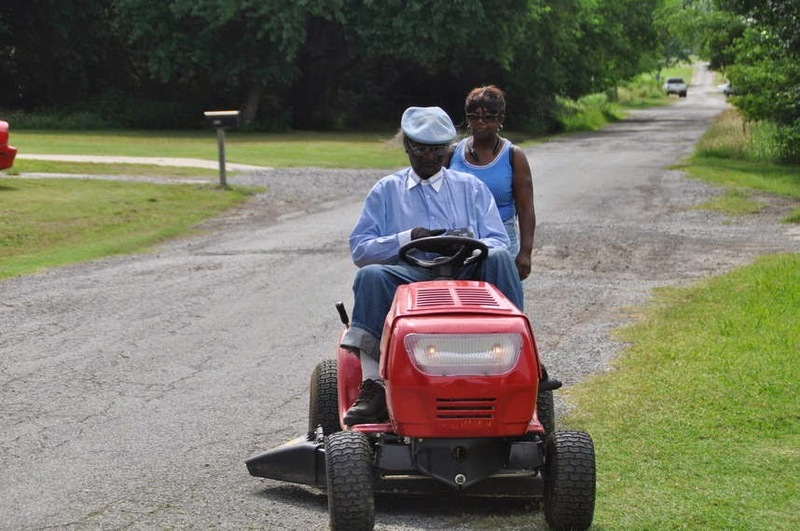 Just as I get to her house here comes dad on his riding lawn mower. We were both happy to see each other. We went back to his house and had a nice visit. He is 86 years old and hard of hearing, but still active. He told us he still has "Charlie" to keep him safe. Charlie is his gun he keeps in his pocket. (Trust me, Charlie is a whole story by it's self.) Remember this is OK. Almost everyone is packin'. As we were leaving town we decided to stop at the Sonic to get a snack. So I walked up to the car hop door to give my order since we had no car to put in the order stall. The car hop looked at me strangely and said "just go to the stall and put in your order". All in a southern twang. So there I stand in a stall, order and wait for the order. Several cars try to pull in the stall. They looked at me crazily as to why was I there. The car hop brings my order and I asked her how do people usually walk up put in a order. She said "you can go through the drive thru" I told her we had a motorhome and that would not work. She looked at the motorhome and look at me and stated " you can go through the drive thru". Ya got to love teenagers. She did not have a clue that the motorhome is as big as the Sonic. We continue on down the road and stopped at our hotel Walmart in Cocatah, OK.
Tanita - shall I wait for yah? Nah - The year was 1953 in the town of Shawnee, OK but it was called Top Hat. The founder changed the name to Sonic in 1959 and the first place to accept the name was in Stillwater, OK.
What is with you two speed demons??? I can't even tell you how it cracks me up that your father in law drives AROUND TOWN on a riding mower. With a gun in his pocket. Some people you couldn't even write books about, because no one would believe them. 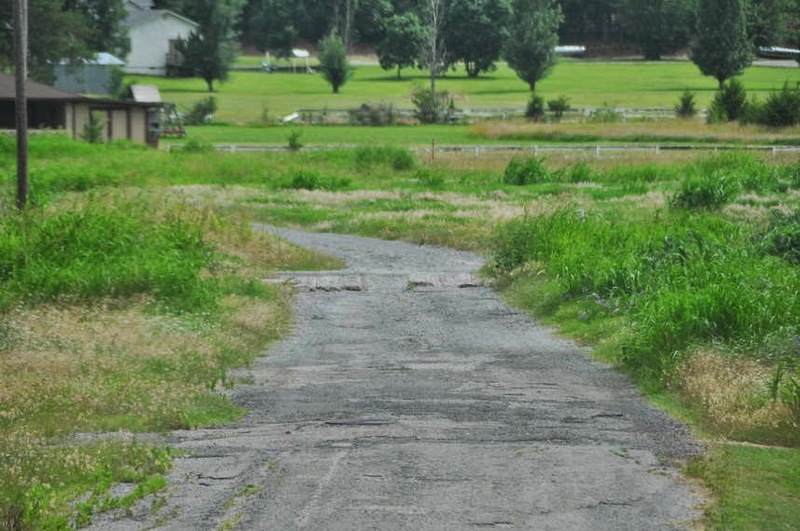 Also, that road looked like a badly paved driveway!